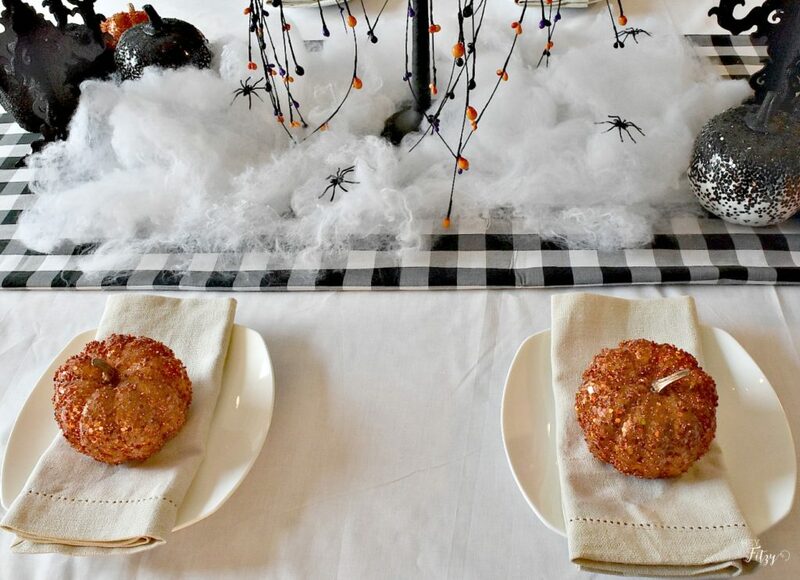 Today I am partnering up with a great group of bloggers to share our Halloween table. 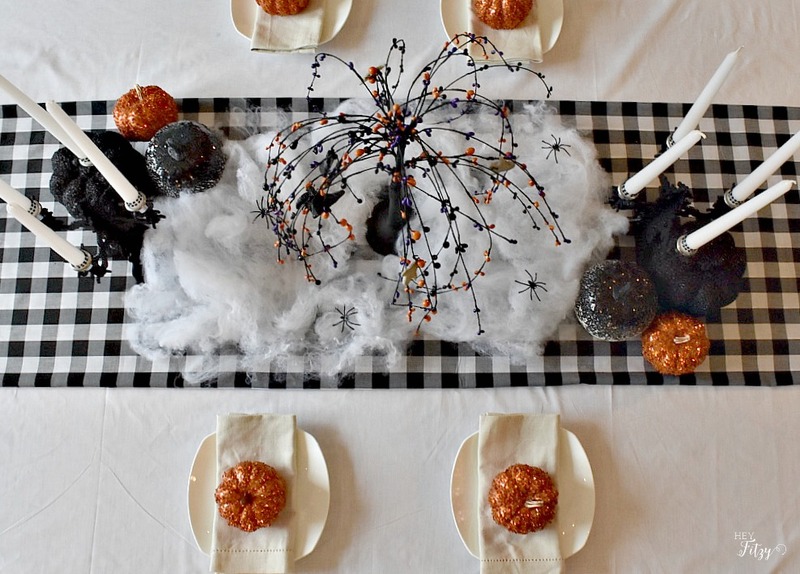 All week long you can follow along as each bloggers shares their spooky halloween table. A special thank you to Chloe of Celebrate and Decorate blog for organizing this fun blog hop. After our recent move from Minnesota to Tennessee I have really focused on simplifying our lives. Less stuff equals more time (and money) to focus on our kiddos. With one already out of the house and one graduating high school this year, we realize more and more how quickly they grow up. Our time with them appears to be fleeting. Before I know it my daughter will be off to college. With that in mind, my halloween table is simple. Keeping it easy takes the stress and pressure off while also making it easy for others to replicate. After a visit to my fabric bin, I used a simple piece of white cotton fabric the size of my table. It isn’t anything fancy but it provided the perfect backdrop that I was looking for. I also used a piece of buffalo plaid fabric to create my table runner. It was a little big so I tucked the edges in to achieve the look I desired. Easy peasy! My original idea was to create spider webs that draped the table. But after playing with the webbing, I liked this look better. I think it looks like something that would come out of a witches cauldron. 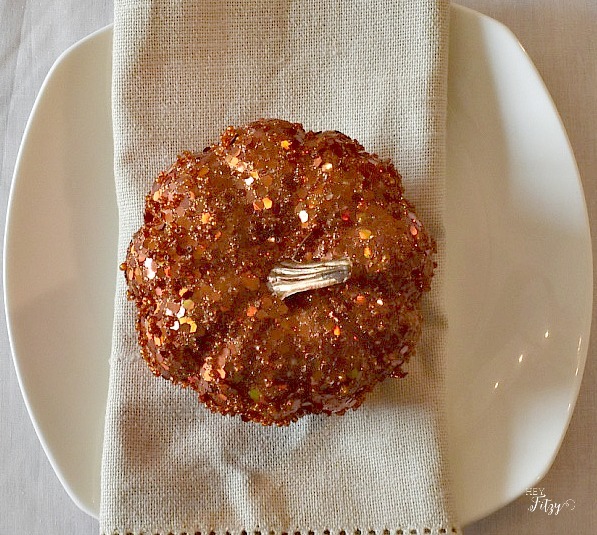 I used some glitter pumpkins for each place setting. These came from Marshals years ago. Clean and simple is the perfect start to this table for me. Then when it comes time to entertain I can add in the special embellishments for that meal. I think the black glitter pumpkins were a Target find last year. For some silly reason this Halloween tree has been a family favorite for years. The kids love getting it out each year. Hope you found some inspiration for your Halloween table. Some times keeping it simply takes the stress off and actually allows us the opportunity to enjoy the moment. Don’t forget to stop by the other fabulous bloggers to find lots of Halloween inspiration. Your family tradition of setting up the Halloween tree is heartwarming. Having gone through the kids growing up and no longer around to fill the house with laughter -I find that its these small things like a Halloween tree that brings back wonderful memories. 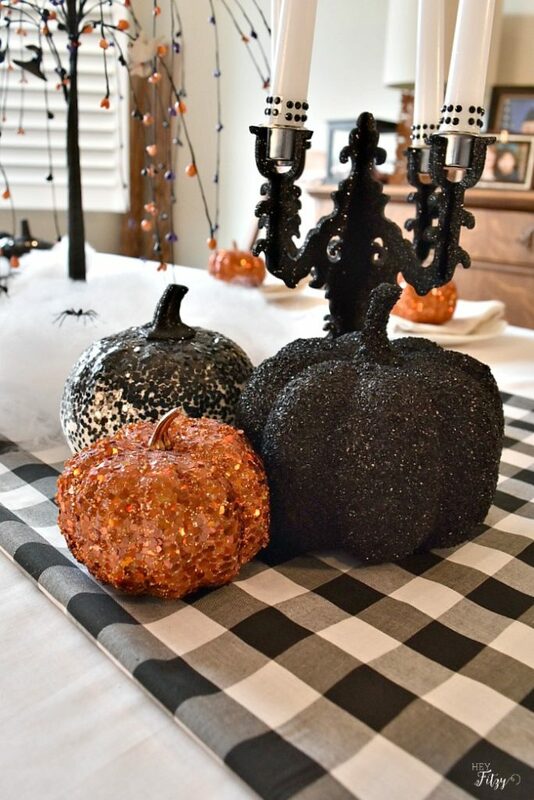 Your sparkle pumpkins and candelabras are a fun way to celebrate Halloween. I am happy I was able to join you in the hop! Hi Ann, This is such a fun hop. So exciting to see the way everyone decorates for Halloween. As my kids get older and older (one already gone and another one leaving for college next year), I find that simple holiday decorations that have withstood the test of time bring me great joy. They truly hold so many wonderful memories! Delightful! Love the fresh simplicity and clean color palette! Isn't it fun to have a tradition like your Halloween tree that is a seasonal must~we have an old wooden birthday cake that my kids insist on and my kids have kids of their own! Thank you Jenna! It is funny what the kids get attached to and long to see year after year! Your Halloween table is just beautiful! I love the oranges against the black and white checked cloth. Your Halloween tree makes the perfect finishing touch. It has been so much fun blog hoping with you this week! Happy Fall! Thank you Shannon! 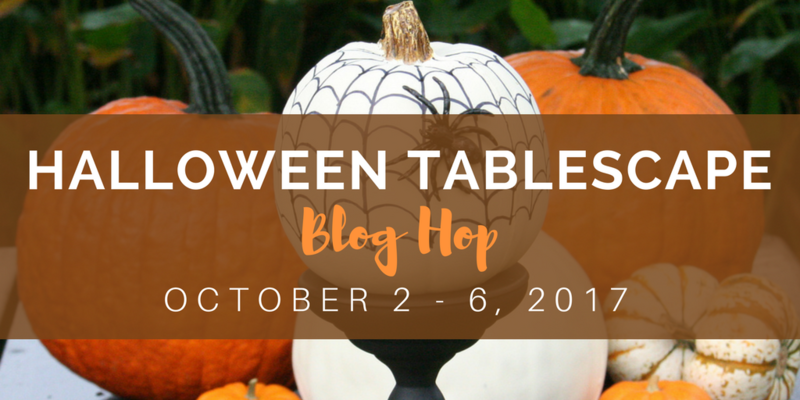 This is such a fun blog hop and I love seeing everyone's halloween table. Thank you Sheila! That little tree has been around for a while and my kids love it! Hi Lynn, Halloween was a huge deal in our last neighborhood and we will miss that. We are still trying to figure out how our new neighborhood will celebrate. I only have one little one left that really celebrates with trick or treating. Always so sad when they start to out grow it! Thank you Amber! I will definitely check it out! A lovely Halloween table, not too scary to enjoy. 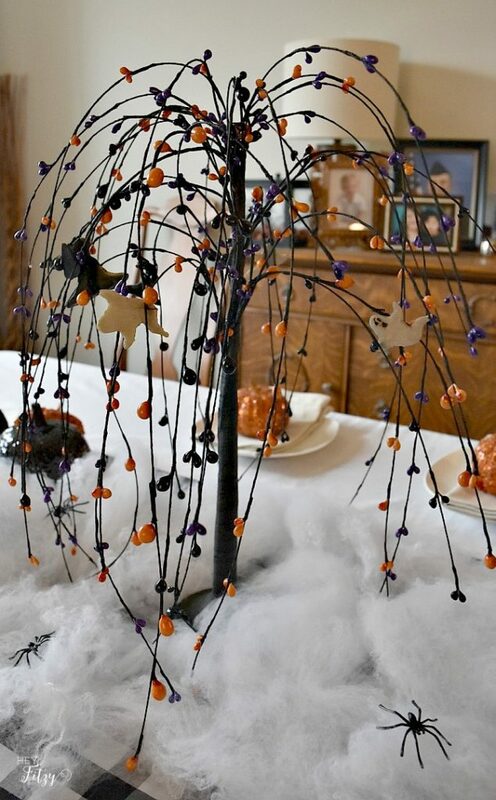 Love the idea of the Halloween tree and being a tradition. The black and white check looks lovely with the orange. Gotta love those blingy pumpkins. Thank you Linda! It is funny to see what my kids get attached to and look forward to decorating with each year. The classic color palette for Halloween always works and I love the simple elegance of your table. I'm also wondering on earth did I miss those glittery pumpkins at Target. Those are a must! Wonderful way to make memories with the Halloween tree. Thank you Carole! So fun creating new memories with cherished holiday decor! A classy, beautiful table! The pumpkins are so gorgeous, and I love the story of the Halloween tree. The black and white checkered cloth looks so elegant with orange accents. Enjoyed playing with you this week! It is such a fun blog hop this week. I love seeing everyone's halloween tables! Thank you for stopping by! Love all your sparkly pumpkins and the candelabra on your table. Great use of your extra fabric with the buffalo check runner you created - it makes the perfect backdrop to that terrific Halloween tree! So nice when you have a decoration that has stood the test of time and becomes a family favourite. Indeed, our kids grow up so fast and it is nice to have these items to remember special occasions spent with them. Thank you Lori! I love to incorporate holiday decor that my kids love. It makes it special for me...and special for them! That is a win-win! Aren't they fun! I secretly wish that I had purchased a few more!! You can never have enough pumpkins...right!!! Tammy I so agree with simplicity....and your tree reminded me of a twig tree that I had many years ago. I used it for every holiday and my kids came to expect it... even after they had moved out of the house. I used it for hanging eggs at Easter, pumpkins at Thanksgiving and so on. Sadly, it has left the building due to many moves, but I have often thought of finding something like it again. Lovely tablescape. Hi Kari, It is fun to see what the kids love year after year. Sounds like you might need to find another twig tree. Your kids would probably be delighted! 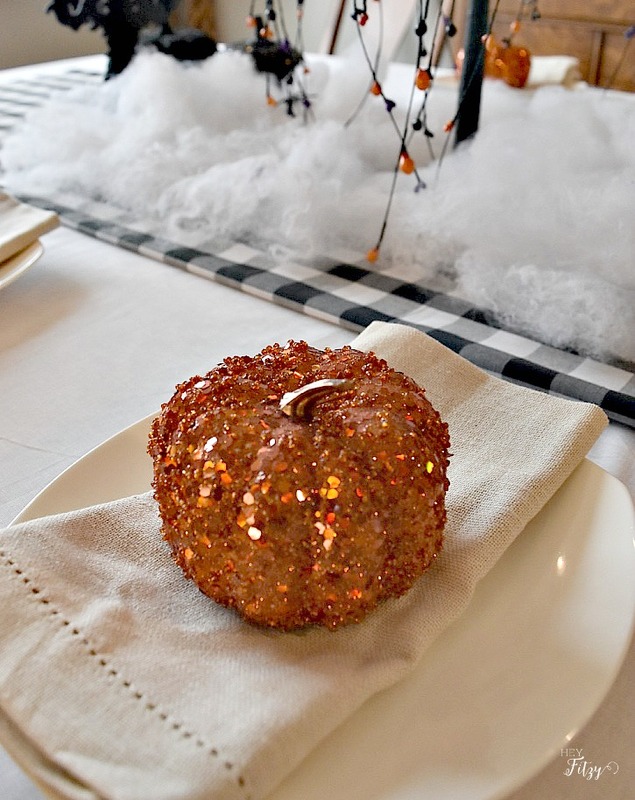 Love the sparkley pumpkins and that cool tree centerpiece!!! Hi Laura, It looks like we run in similar circles! Hope you have a fabulous time in MN for parent's weekend! We have fallen in love with Franklin and really love our time in Tennessee! Thank you Donna! The traditions from year to year always make it feel a little more special! Tammy, I am in love with those glitter pumpkins! I am coming over to your next dinner party! Thank you Rhonda! Come on over! We would love to have ya!! !